True that. A legitimate critique and challenge. Curious to see how Pence responds to this. Same here, I really like Pete, he impresses me more and more I listen to him. Who gives a flying fck how pence responds? To care is to empower…stand on what you know is truth (which is what Pete said) and to hell with the false prophets. I’m glad Pete stood up to that jerk because besides being a racist homophobe Pence is just plain creepy any man who refers to their wife as “Mother” is not to be trusted. I’m glad the candidate showed more sense and civil discussion than the Queerty editors/writers, who chose a sensationalistic clickbait headline wording, as well as a repeated juvenile adjective like “butthurt”, to try and demean VPOTUS. I am no fan of Pence, but logical and mature, objective and fact-based, talking points are the best offense against a POTUS who so often similarly sinks to that level of dismissiveness and namecalling. Except you are talking as if you are a fan of Pence. He is a rabid homophobe who was fine with tanking the economy of an entire state as long as he could harm LGBT people by doing it. He has demeaned himself. Pointing that out does not make him a victim. domen8r, if you have read DCguy’s past and present comments, you should realize that it’s impossible to reason with an unreasonable person like DCguy, who doesn’t know anything about civility, decency, and maturity. He, like most extreme liberals, is angry and bitter and domineering. Any opinion deviating from their belief system, is heresy. He will attack you like a mad dog and a mad dog he is. In many ways, he behaves very much like a conservative nutjob. He is the new alt Left. Civility begins with both parties being civil, neither Pence nor his wife have ever been civil to anything that goes against their bronze aged gods. There was nothing in DCguys comments that came across as uncivil, there was however much in yours. I agree with you that civility begins with both parties, which neither party practices, but AgainNagain was not referring to that one specific comment by DCguy. He was referencing DCguy’s overall speech on Queerty. There is no defense for the Pence’s positions, and likewise there is no defense for DCguy’s pattern of rudeness, insults, and calls for Queerty to silence many people who disagree with him. But it is amazing that we live in a country where both Pence and DCguy have the right to spread their hate. Gotta love freedom. “Clapback” “snivelling” and “butthurt” are not “pointing out he has demeaned himself.” They are static in a much more important discussion which Buttigieg is handling much better than Pence, and lightyears better than Queerty. The way Queerty has implied attitude and direct quotes to a promising articulate candidate is what’s demeaning. You are correct when you are having a discussion, regarding civil individuals but there are some who you have to stoop to THEIR level and use the language they know so they will understand your opinions and points of view. Pence has made it perfectly clear his stand on the LGBT Community so when I talk about him, I use the same kind of inference he does to the Gay Community. He’s a F*ckTard @$$ hole so I refer to him as one. I think he is probably capable of understanding that. Let me make this simple so even a dimwit like you can comprehend….your highness, sit on a pickle and twirl gurl. .any fool knows you don’t serve high tea in a swamp full of gators…don’t believe me…ask your bio daddy…you’ll find him at the payless going out of business sale in the size 14 aisle. Referring to your wife as “MOTHER “ is way beyond Queer ! “Sniveling”. You tell him Petey boy! There’s a bottom in that boy….hallelujah! VP Pence is one of the most socially conservative members in the Trump WH. He and his wife are extreme homophobes. Mayor Pete is not out of line mentioning what VP Pence did as governor that was so hurtful and disrespectful to his statewide constituency. 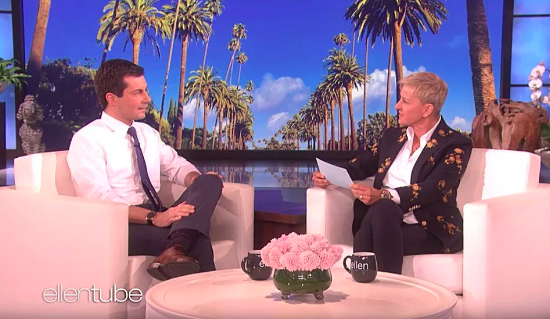 I think Mayor Pete has made a good argument for gays of faith and against the Pence very conservative homophobic Evangelical view of our community. Politicians and others for too long have allowed such homophobes the freedom to express their vile hatred against our community. It seems that will no longer be so easy to do with the number of LGBTs out in our communities. …..people are scared and jealous and I cannot think of anything more disrespectful to yourself!!!! If you are such a brainwashed nerd who likes the bible, you need to develop a spine and acknowledge history, not bury your head in the sand.